There’s a secret little spot I found which is decorated much like the front room of the house I grew up in – wood paneling from floor almost to the ceiling and plush furniture. We didn’t have a copper surround fireplace but you can’t have it all (and it was about a quarter the size :-D). I was here at the invitation of the press team for a special chance to review the brand new afternoon tea they launched with new teas and tea sommeliers. When I arrived at the hotel I was greeted by a top-hat wearing doorman who was extremely helpful and directed me to the dedicated area they have for afternoon tea (which I seem to always call high tea for some reason) where I waited for my companion. While it was rather posh and there is a dress code (so the ripped jeans had to stay at home) it was also really laid back and the staff were brilliant at putting myself and my guest at ease. We were offered one of two types of tea on the day – a traditional (bottomless) afternoon tea fare of the usual sandwiches, scones, patisserie and cake or a “tea-tox” light tea with light options for those trying to cut down. What I think is extraordinary is that, if you book in advance and give them 48 hours notice, there is a GLUTEN FREE option. 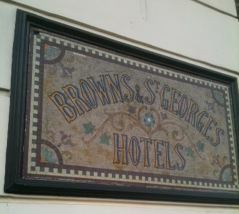 I kid you not – Brown’s Hotel offers a gluten free afternoon tea option. Now, I was tempted to try it but I opted for the traditional tea though I may have to go back and buy another one myself to experience the gluten free option. I’m not coeliac but I have a wheat intolerance so a gluten free afternoon tea is an exciting prospect! I started with the rose champagne which was slightly fizzier on first pour than I usually like but calmed down as the afternoon wore on – as you would expect 😉 We opted to try the new Lalani range of teas and as I mentioned I went for the traditional tea. My friend also opted for the traditional tea service and so I got to experience a bit of each. I have to say, overall I was impressed and I watched how others were served and while we may have been chatted to a little more, everyone was given excellent service. I loved the way the family near us were able to get extra plates of sandwiches before they had started theirs so all the kids could take 2 right away. That’s top service! I wish to point out again that you get free refills of everything. By free refills I mean they replenish all sandwiches, scones and cakes as part of the afternoon tea package. No, that was not because I was there to review – that is just the way they roll. Got a big appetite? Not eaten breakfast? Want a place you know you won’t leave hungry (like Harrod’s for example – though Harrod’s afternoon tea was so bad I’m not sure you’d want more anyway)? Go to Brown’s because not only is the afternoon tea replenished, it is near Piccadilly and yet down a side street so quiet and you’ll enjoy your tea in comfort. So what was the actual food like? From the tea sommelier to the warm scones wrapped in a cloth it was perfect. One of the things that forced me to actually review Harrod’s tea was the sloppy sandwiches and this time my friend got to see what proper tea sandwiches should look like. Not a mess made by a child but straight, perfect edges. Clearly professional and the attention to detail was not lost on us. 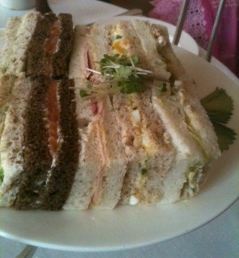 For example with the sandwiches, the choice of bread was made to balance with the filling. This was a calculated balancing act making sure the bread complimented the filling. The best example was probably the salmon with the very dark bread I would usually associate with a very dark wheat rye but I don’t think that was what it was. It had a slightly salty flavour which perfectly balanced the salmon and cream cheese. When even your bread is selected carefully so that you have the perfect balance of flavours you know you are somewhere special. The scones wrapped in their little blanket cake with cool clotted cream so it did not melt and homemade strawberry jam. The scones were small, making them a more two-bite scones which also makes them more dainty. I’m a cream before the jam kind of person and found these warm scones absolutely brilliant, perfectly baked and the right balance of flavours and textures. I wish I could get these more often (no I don’t – I’d be the size of a whale and sick because I would not stop eating them)! That cloth-wrapped warm bundle of joy was topped with the best part – the patisserie! These little cakes were great. The macaron was blue so I had to try it. There was jam and the macaron was soften than I usually prefer but the flavour balance was brilliant. While the only chocolate on the plate was a chocolate crown on the pistachio tart, I consoled myself with another scone and some Victoria sponge which was perfect – a bit of crust, a generous sprinkling of icing sugar and the right balance of butter cream and jam inside. Delicious! Of course I have to mention the tea. Great care was taken to prepare the tea perfectly. An egg timer was used to ensure the perfect brewing time, a ceramic pot was used to perfect the flavour as the metal tea pots were used for many teas and so the tea could react with it and a beautiful oval glass was used. This glass was selected for its ability to concentrate the flavour without ruining them and also it brought out the scents so perfectly. 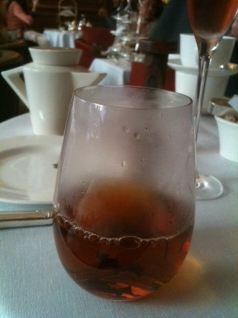 Like fine wine, the tea was treated with the utmost respect and care to ensure all flavours came out. 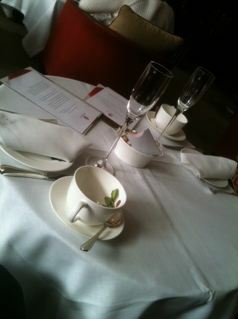 There were 3 Lalani teas on offer and each complimented a different element of the afternoon tea. Carefully prepared in ceramic tea pots which were dedicated to the cause rather than metal ones which have help all sorts of brews, these pots held a single cup of tea only. I say ‘cup’ but really these are specially blown glasses which both concentrate the flavours without forcing the tannins to come through. They are all different, with different levels of oxidization and different flavours. 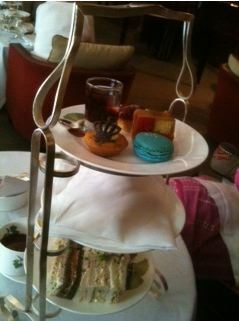 The three teas also compliment different parts of the high tea – the sandwiches, the scones and the sweets. I have notes on each tea but I’m also going to be reviewing them so suffice it to say that you would be much better off adding the small supplement to your afternoon tea and experiencing these stunning teas than denying yourself the pleasure of their exquisite flavours. They are rare and masterfully made and you are unlikely to be able to taste their equal unless you buy yourself a special teapot, glasses and egg timer as well as making sure the water is the perfect temperature. Ya, exactly, it’s easier to pay extra and get the world’s greatest tea. All in all this was a brilliant tea and as I specified, not just because I was there to review it. I watched the treatment of other customers like the lovebirds who got help getting their picture taken, the friends who wanted an extra elderflower jelly and of course the family with all those kids getting extra sandwiches right away so the kids could all have what they wanted right away. 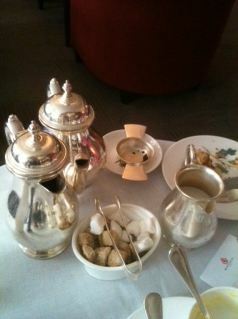 I highly recommend Brown’s Hotel afternoon tea as *the* thing to do in London any day of the week. It is so refreshingly different and delightful without being stuffy and haughty. It is the perfect balance of service, quality and atmosphere. With a low calorie (no sugar) option which *may* suit diabetics (do check) and a gluten free option (48h notice) they cater for everyone as well. Now that is a really useful review. If ever I make it up to the Big Smoke again and looking for a special place to go, I think you’ve found it for me. The only thing I couldn’t see was the price – which is always useful! Thank you.